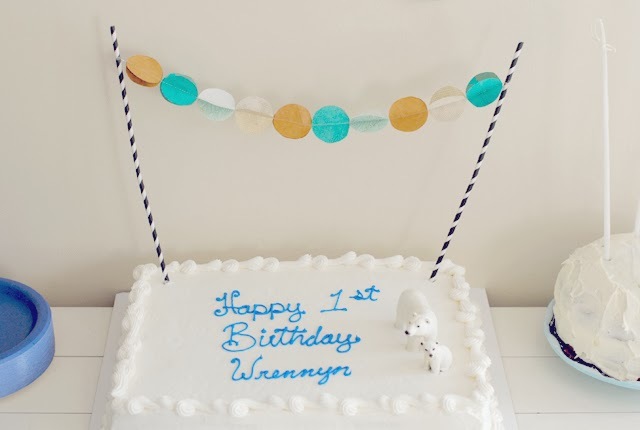 The theme for Wrennyn's party actually came from the love of a silly game of fetch. Yes, that kind of fetch. As in, my mom would throw the Polar Bear and Wrennyn would go and get it and bring it back to her. I wasn't sure how I was going to go about the theme, but I knew the polar bears were special ans Wrennyn really loved to carry them around in his little fists. Around the holidays I had stumbled into Anthropologie and saw the garland on their tree. 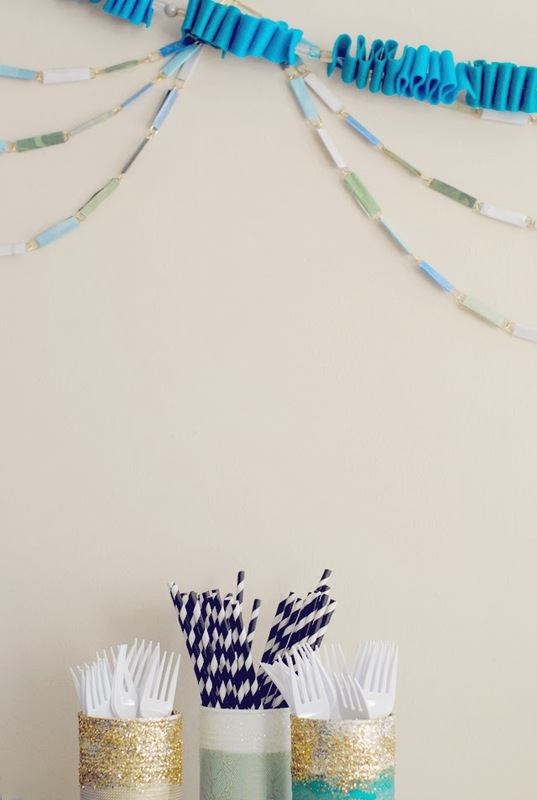 As it turned out, the handmade garlands were in multiple shades of blues and greens and they were simple and lovely. 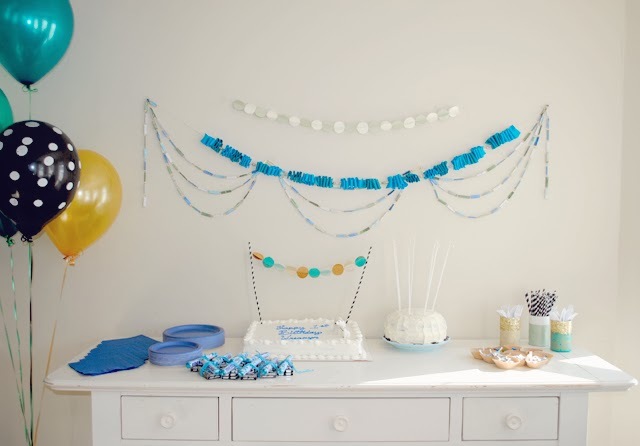 The party planning pretty much came from the basic look of their garland. 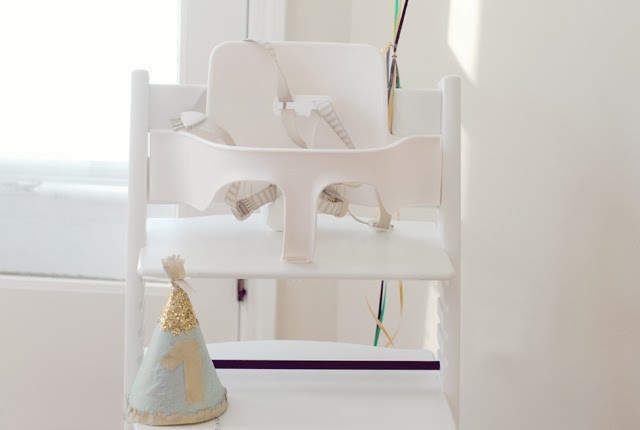 I added some gold for a little softer balance and it just seemed to fit with the first birthdays being so special. I made all the decor myself. 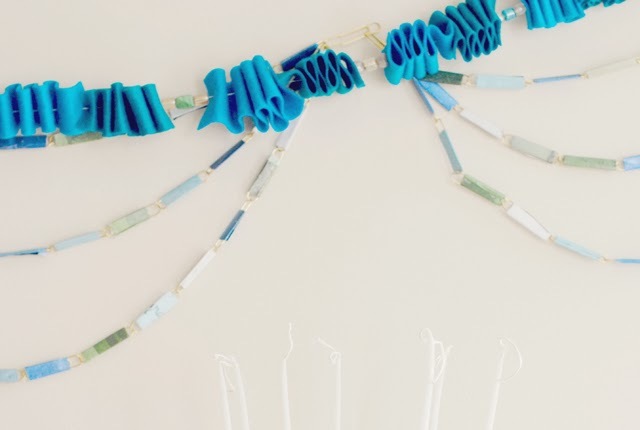 Paper clip garland with paper glued to it is the scalloped backdrop that brings a very festive perspective - then there is the felt garland that is just cut into strips and I used a hand needle to thread it like an accordion along with some beads. 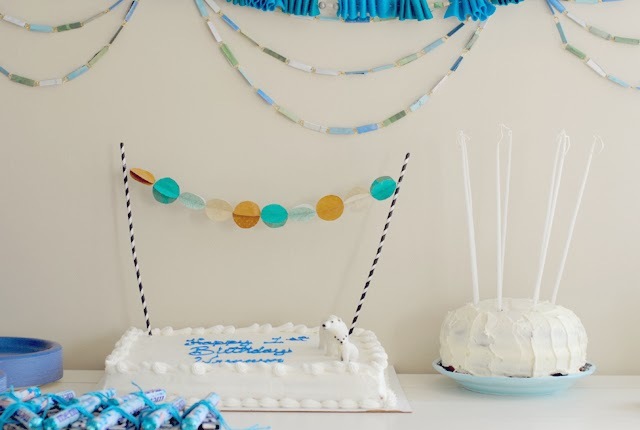 Then, I just cut some paper in circles and used my sewing machine to sew them together creating the simple top garland that is disconnected from the others, as well as the cake topper. I took tin cans that I used mod podge, glitter, and paper to spruce them up and hold the plasticware. 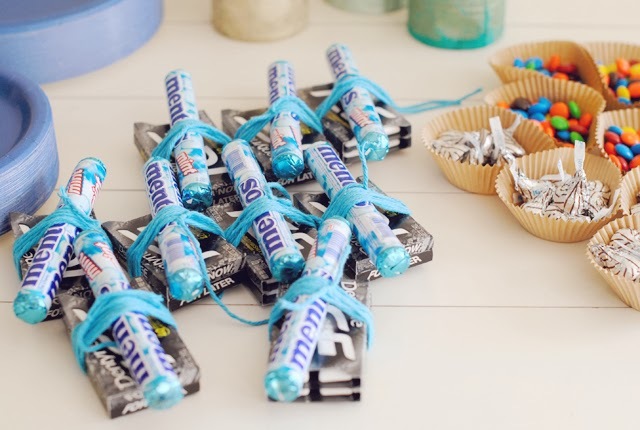 The party favors I kept simple - they are "ice" gum and mentos to go with the Polar theme and I used a simple blue yarn to tie them up. I also placed loose candy into gold muffin molds as a simple treat that was set out. You don't have to spend a lot of money to have a unique and lovely party. There are so many ways to make it special. 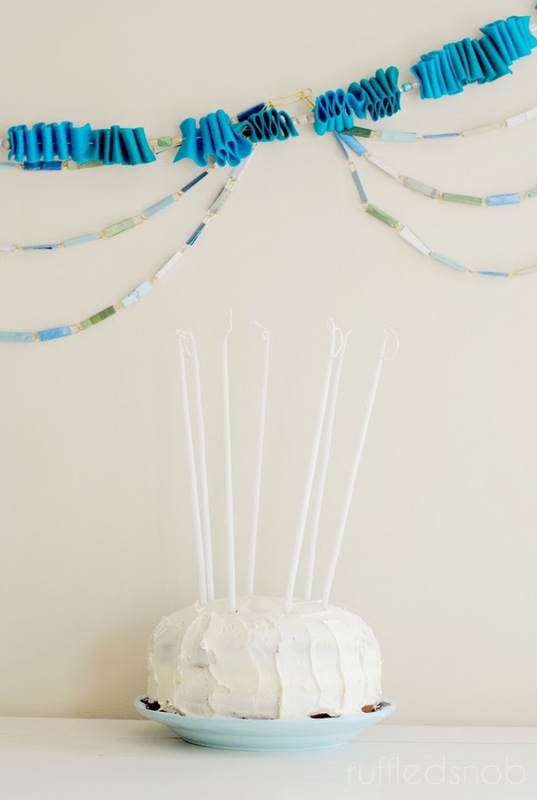 I literally bought 3 pieces of large specialty paper from Paper Source for $16.97 and used them for all of the garlands, birthday crown and decor. The paper clip and felt garlands added about another $8. I spent a fair amount on the food and cakes, but overall the decor was really a low budget thanks to a little time spent staying up late crafting - which I have missed dearly. 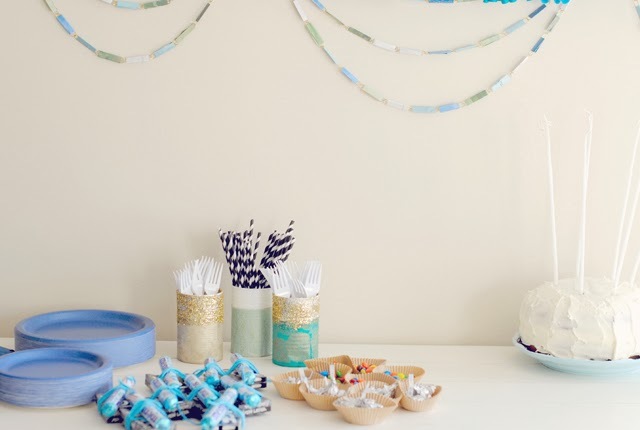 I will share more photos from his birthday, but I just wanted to share the table and simple decor because I feel people put too much pressure on parties and going out to locations of buying decor. 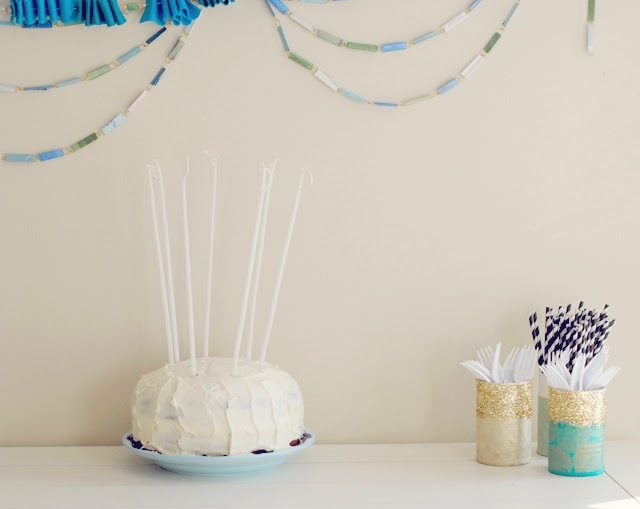 I love simple at home parties and I love when the inspiration comes from unlikely places!